Hello everyone! It's time for another great blog hop from The Stamp Review Crew! This time around we are featuring projects that use the Petite Petals stamp set! I am your stop after the fabulous Yapha Mason! I went very clean and simple! I did use a few new products with this card! Now it's time to send you on to the talented Bronwyn Eastley! Thanks for stopping by and have a super day! I love this, so clean and simple! The colors are so pretty together. Cute, cute, cute! Love this layout and that fabulous twine! I LOVE it!! It's so pretty and pop's. I love the touch of vellum on it too. What a gorgeous card, Debra! I love how clean you kept it! Oh, love this card. Love the clean white background with pops of color and just enough detail to make it special. TFS! Debra, the perfect example of CAS! 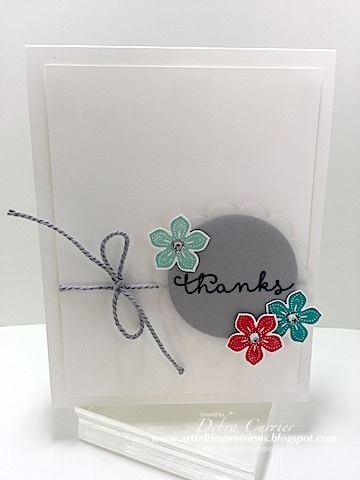 I have always loved gray, and that is such a perfect way to incorporate it into a card! Nicely done! I liked your card very much. It's simple but pretty at the same time. And so many colors to choose from. A perfect balance of layout and color! Love the clean and simple design. I am loving the new fonts in some of our new stamp sets and this is one of my favorites. Sweet card!